Grit in the Gears: Fruit. The picture made me think of another fruity incident:- Harry Chapin, long ago, sang a song about a crash in Scranton, Pennsylvania. On his Album, Verities and Balderdash. 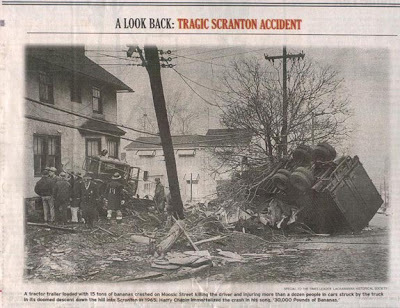 On March 18, 1965, on Moosic Street in Scranton, a tractor-trailer carrying 15 tons of bananas lost control in rush hour traffic, hitting cars, houses, and wire poles before crashing into a home. The driver, Eugene P. Sesky (35), was killed and over 15 people were injured. In 1974, Harry Chapin ( more famous for his song "Cat's in the Cradle,") told the story of the tragic events of 1965 in the city of Scranton, in his song "30,000 Pounds of Bananas." Yes, just about thirty thousand pounds . Having looked into this further. Harry Chapin wrote this song less than ten years after the man died. There was a widow and children. After being criticised for the song, Chapin said he would donate the proceeds from the record to the widow and children. They never got a penny. "As a native of Scranton's South side, I remember the day, and the man in the truck. His name was Gene Seski. Gene loved playing guitar and keeping an eye on neighbors kids. I know he watched me, and my brothers, a few times for my parents. He would also walk across the parking lot in the snow in Hilltop Manor barefoot. He was my inspiration to become a truckdriver, which I am still today after 20 years." If you hear that song again, spare a thought for Gene Seski, a man who played guitar, looked after neighbours' kids, walked barefoot in the snow, a father, a husband, a real person, who was killed by a brake failure, never got to see his children grow up, his grandchildren too. It's too easy just to hear the song and let it run by as a thing of fun, of comedy. Why are bananas funny? This song isn't a funny song about a lot of bananas. When you look a little more closely, it's about a man dying. I never knew it was actually about a real tragedy. However, I've never thought about it in a fun way, and as a child (born in 1983) I would listen to it and be horrified. Thank you for your post. Thank You for posting this information.I am the trucker who followed in Gene's foot steps.For 21 yrs now I have driven a truck.I still remember the night my father got the call about Mr Seski's accident.A good man.A man I would be proud to run with if he were alive today as a driver.I could only hope to walk in his shoes! !That was when truckdrivers stuck together,and you were truly a "Knight of the road"!! Anyone wanting to know if it was true,,Yes it was a true story.Looking at the picture just reminds me how violent the crash had to be. I never met this man Gene Seski, but he was a very good friend of my father and mother. When they got the call about his good friend, (they grew up together and hung around together when they were children) (hmm guess in those days everyone knew just about everyone) Anyway, I would have loved to have met this man. My father passed on five years ago, but to this day because the song was about one of his very good friends he did not ever eat a banana and we were forbidden to even breathe about this song. I totally agree that it was in bad taste, but I do not think it was supposed to be meant that way. I can hardly believe that Harry Chapin would have done that. Many years have gone by but I hope that Gene Seski and my father John Lewandowski are now in the after-life having fun and free of they pain they each experienced leaving this life. Last but not least. Yes, the story is true, and somewhere in the midst of my parents belonging there is an article about it. Gene Seski is a hero for flipping the truck on it's side (sure death sentence) to save others. As for the story of Harry Chapin donating the money to the Seksi family...well that is actually false. He donated future proceeds to his World Hunger organization. If you got to Harrychapimusic.com you'll see links to his chariies...it's just a song folks, and Harry actually did it just because he was told the story on a bus travelling home and liked it. His lyrics never impune Mr. seski as being at fault or being a bad driver at all. If anything they make Seski out to be what he died as...a hero. The claim that Chapin said he would donate the song's royalties to the widow and children came from what I can only describe as "a very close source". Someone who knows what was said, and the circumstances. I can find no evidence in contemporary witness reports that Mr Seski deliberately flipped the truck on its side. All the reports of the time state that the truck was out of control. My Dad operated a gasoline service station on Moosic Street across from Chick's Diner. My Dad witnessed several run away trucks as hi station was on the right hand side of Moosic Street. Dad was outside of the station the day Gene battled his runaway rig. As my Dad told me, Gene made every effort to steer his rig away from the gasoline pumps and my Dad; saving many lives from the fire that would have erupted if rig tipped over in the gas station. My Dad told me that Gene did a wonderful job controlling the rig and was a HERO. Trucks were banned from Moosic Street sometime after this tragic event. Thanks, J.M. for that, eyewitness evidence, though being a bit of a cynic, as I am, I'd suggest steering away from a gas station would be a quite natural thing to try. I think what I was trying to say was that the contemporary press and police said the truck was "out of control", it could not be stopped or steered out of danger, and one way or another, it was going to crash. We can try guess what Mr Seski did, what he thought, but nobody, other than the man who was in that cab, will ever truly know. I just hope, sometimes, Scranton's residents give him a thought. I will have to post again here,Gene did all he could with the truck coming off Moosic St hill.He swiped alot of trees along the street that day.He flipped because of hitting the house on the left corner of Irving and Moosic,coming down the hill,and then slid across to the yard of the house across Irving ave.My dad and mom knew the Seski family well.Seems almost everyone in Hilltop Manor knew each other in them days. You know what is shocking about this story... Harry Chapin got killed in a car accident in 1981 and the coroer determined that he probably had a heartattack which is what caused him to swerve into the road. despite this, and I quote wikipedia: "Even though Chapin was driving without a license, his driver's having previously been revoked for a long string of traffic violations, his widow Sandy won a $12 million decision in a negligence lawsuit against Supermarkets General, the owners of the truck." Scum of the earth, I say... Would anyone like my copy of Harry Chapin. I have lost my taste for it. What does Chapin's widow winning a lawsuit have to do with him? He was dead when that happened. If it reflects poorly on anyone, it's Sandy. Anyway, no one is perfect. Johnny Cash, JFK, and FDR all cheated on their wives. Harry Chapin's songs have inspired millions of people, often commenting on serious issues such as education, racism, infidelity, abortion, and abuse. If he messed up a few times you can't blame him, he was human. Think about what you say before you say it. I'd say it reflects extremely poorly upon Harry Chapin that he was driving illegally, however, Nothabo says he swerved, possibly due to a heart attack. If that is so, then why would a court award damages against the truck owners? It can only be because they held the truck company responsible for his death. His widow is entitled to claim against them for negligence, and Harry's status is not relevant in deciding whether the trucking company was negligent in the accident that killed him. "You can't blame him, he was human"? Well, I suppose you can say the same for pretty much anybody, Charles Manson, for instance. Ultimately, we all can be blamed for our lapses. I agree, Anon, that he wrote a lot of great songs, and desrves our respect for them, but i did change how I felt about him as a person, when I started to realise that Gene Seski was a human, a man with a family, who died tragically, and Harry Chapin turned his death into a joke. He played the song for laughs. That's not a nice thing to do. If he ever meets Gene Seski in the afterlife, he'll not be able to complain if he gets a punch on the nose. I really do not know how I got to this site. I was looking up Scranton history and after a few clicks, I am here. I can add just a bit of personal color to the conversation. My family were neighbors and my brother and I played with the Sesky children. As a matter of fact, I graduated from Technical High School with his daughter and his son was my brothers’ age. Something tells me I remember one more child, but, I could be wrong. This is the first time I realized he died on Irving. I remember them living just a few doors from us on Irving, near Cherry Street, at the time of the accident. If I remember the house correctly, it is still there. A while after, the family moved around the corner on Cherry. Thanks, gmichaels, for the comment. When I originally posted, it was because I'd found the song was about a real incident. Since then, I've learned a lot more, heard from people, including Mr Seski's daughter, some of whom do not wish to be quoted, there's still some mystery as to why it happened, given that Gene Seski would have been well aware of the danger of that hill. Why didn't he shift to low gear? why did he rely on the brakes, not on the gears? What I do know, is that Gene Seski was a real person, a young father with a loving family, that he was missed by many, that his death was an avoidable tragedy. I find myself critical of Harry Chapin, for playing this song for laughs, yet I can't deny that Harry Chapin is also the one who stopped Gene from being forgotten by the wider world. This post still gets a lot of hits, people read it every week, people from all over the world, though, if we analyse reader patterns a bit more, there are a lot from Scranton. And quite a few who remember him. Someone suggested there should be a memorial on Moosic street, and I think that would be a good thing, seeing as so many people remember him. I just parachuted in, via google earth, and stood in the middle of Moosic st, at S.Irving Ave, where the crash occurred. I can see the steep grades on Moosic, but it looks a pleasant residential area, hard to imagine the chaos of that night in 1965. I just deleted a comment by an anonymous poster, which I found to be offensive in several ways. I am not religious, but I think many christians would have found the wording offensive, and the commenter then somehow brought in a diatribe about communists and the current elected president of the United States of America. I can't quite see the relevance. Anonymous commenter: If you are an american, bear in mind that your fellow americans elected your president. If your chosen candidate lost, then be big enough to accept that you lost. In a few years time you'll get another chance to vote. Congratulations, F@@kwit spammer, your spamvert was up for almost two whole hours. And now you are cursed. Can you feel it? Will you know why bad things happen to you? I am a Scrantonian that grew up around trucks and rode shotgun a few years in the '60s and paid attention to anything I thought I could learn about driving trucks and about the mechanical aspects. I eventually became a truck driver and logged over two million miles in 18-wheelers and a bunch more miles in tri-axles and pulling mobile homes and more and again in more 18-wheelers before hanging up my CDL. I've experience brake failure at least a couple of times and was very fortunate to have been able to avoid what would have been terrible accidents. I remember actually standing up on the brakes (had plenty of air pressure but the conditions of long, steep grades and heavy loads with older trucks and back yard mechanics made for some hair-raising rides). I knew truckers who were not so fortunate and lost their lives in various truck wrecks. I almost lost my life more than once. I can attest to the fact that even if Seski had shifted into low gear the engine and transmission would not have held up and would not have been able to keep the truck at a safe speed if there was brake failure. That hill on route 307 coming off the mountain near Lake Scranton and leading down into Scranton on Moosic Street is long and steep and has been the site of many bad accidents involving more than a few trucks and a bus or two. I remember the sign telling drivers to shift into low gear before descending the hill, but I also remember thinking, "What good is that going to do if your brakes are not up to snuff and fail"?) Heavy trucks should been banned from that route by the DOT long before that infamous banana truck accident took place. Whatever the reason Seski chose to go down that hill, his chances of reaching the bottom safely were next to nil and those who survived it before him were extremely fortunate. Did anyone consider that this was the normal route into Scranton before the interstates were built? You either came down the mountain or drove miles and miles out of the way. Can anyone think of another route that doesn't involve going down a long grade to get to Scranton? Let's not blame Mr. Seski for the tragedy that took his life. Instead, if you are that interested in the wreck, you should do some research or talk to people who know the area and/or talk to people who drove these rigs and know a thing or two about them. Epetro:thanks for the comment, you've obviously thought quite a bit about this incident. I thought Chapin's song wasn't meant to be rude or mock the truck driver at all. It felt more like an observation on how people behave when a bizarre tragedy strikes--we all talk about the odd circumstances, and we sometimes forget a loving, living, feeling person was involved. That said, it would have been nice, and just as effective, if Chapin had made up a similiar event that wouldn't stir up sad memories for the family. i remember reading that story when i was a teenager. since then i have been behind the wheel for 41 years. i can't help to think that he had a broken air line or bad air compressor that made him lose his air completly. you have to remember that that was before emergency spring brakes(maxi brakes)no air and you are free wheeling.if gene had burnt up his brakes someone would have seen them smoking as he came down the grade. according to the story he scraped against everything he could find to try and slow that old brockway down (tree,poles cars) he could have bailed out of that runaway rig but drivers back then just didn't do that if they thought they could spare someone's life. maybe he had some kind of an medical attack. was there ever an investigation or was it just blown off as driver error. deep down i don't think it was.may you rest in peace gene and god bless your family. i remember when i was younger my father Timmy Coggins may he rest in peace told me about this after i heard the song and went on to show me a picture of the mans son in his year book so i definitely have 2 separate views on this one especially after loosing a father fairly young myself. I was offended by the song and wondered, until I found this site, how Seski's family must have felt, less than ten years after the accident, about an entertainer playing the death of a 35-year old son, husband and father for laughs. The youtube videos unmistakably show that the song was intended to get audience participation going (as if the music itself and the fellow with the bass voice singing the words "of bananas" wasn't enough of a tip-off) in an entertaining fashion. Gordon Lightfoot immortalized the men who died on the Edmund Fitzgerald in a respectful and dignified fashion. If a song is performed about someone who died within recent memory, and who probably has family members still around, then you do it, if at all, the Gordon Lightfoot way. Chapin's song was insensitive and in remarkably bad taste. Chapin was a gifted artist who apparently did a lot of charitable work. That does not, however, excuse him for showing extraordinarily poor judgment with respect to the song about Mr. Seski. I did not think the song was funny the first time I heard it, and I still don't today. Thank you, Soubriquet, for creating and keeping up this link. Sesky's family lived next door to us in Scranton when I was a kid. The children (there was no infant like in the song) used to throw stuff at us when we were in the yard. I have no good memories of them. The song certainly didn't offend me, if anything, it romanticized the family. Chapin has told a lot of stories about a lot of people including himself. I'm sure they all have people who both love and hate them and have opinions of wether they are in good taste or in bad taste. They all have something in common. They tell the stories about human nature and regardless of them being humorous or serious I think they tell the kind of stories that reveals the humanity of everyday people. I did not know Gene and would have never given this story a second thought if I read about it in a news article. That said... the song has immortalized in my mind the terror and tragedy of a man who was finishing up a normal day before heading home to his family. Whenever I hear the song, the walkaway is that I feel sad for Gene and his family's loss. The manner in which the story is told makes me remember them and has never made it seem like some sort of a joke. God rest Gene and his young soul. According to the unauthorized biography of Harry Chapin ("Taxi" by Peter Coan), he was killed when his car had a mechanical failure of some kind; he was trying to get off the road while coasting with no power, and was hit by the grocery truck. At some point in all of this, he had a heart attack. The reason for the lawsuit was that the truck driver refused to let him move over, so the driver did share blame for the accident. As I understand it, when Chapin wrote the song, he had, as he says in the song, heard about it second-hand while on a bus trip, and may not have known how recently it had occurred. When he originally wrote it, he intended the song to be serious, an indictment of the demands placed on workers by an ever-increasing consumerist society, but when he played it for the band, they thought it was hilarious, so he decided to play it for laughs. 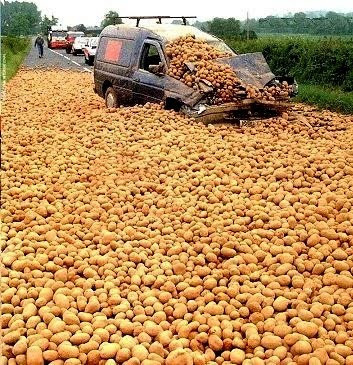 But his real point is still in there, that in the midst of this absurd scene of a road filled with mashed bananas, a man has died. He also invented all the details about the driver; the character in the song differs from Gene Seski in practically every way, including the nature of the fatal injuries he sustained in the accident. The song is inspired by the incident but is not intended as a factual account. Harry most likely did promise to donate the royalties to the family, but given the frantic pace of his touring schedule and what appears to be a case of ADHD (at one point he was simultaneously the director of a theater in Long Island, chairman of the President's Commission on World Hunger, serving on the boards of at least two other charities, and playing over 200 shows a year, half of them for charities), he may well have simply forgotten to follow up on it with his business management. I believe he did honor his pledge to never play the song at any venue within a certain distance of Scranton. From all reports, and from the evidence of his life, he could be thoughtless and irresponsible at times, but never malicious or greedy. Terrific, informative post here, man. Thanks for all that information. Actually the original song wasn't meant to be funny, it was simply a story, which was what Chapin's songs generally were. And it actually sound fairly accurate in the details. If the song became taken lightly in concert, well, I guess you can have fault with Harry for that. However, you'd have to weigh it against the good things about Harry, such as the fact that he played fully half his concerts for the last several years of his life for charity (and he wasn't a rich man - could you imagine if a Bruce Springsteen or whatever boy band is hot these days did that?) And worked many, many hours for charity (he started a foundation for world hunger that still exists thirty years after his death). I don't think you could come up with a musician that has done more for other people. If it wasn't intended to be funny, then why did he play it for laughs? Why emphasise bananas? Whatever else he did in his life, however good a person, you can't escape that he wrote a song about a man dying, and turned it into a comedy. I like Harry Chapin's songs, but it doesn't alter that fact. Sometimes great misfortunes are funny. In a great twist of irony, Harry Chapin was killed when his car was run over by a tractor trailer. In anther great twist of irony, this accident has been recorded forever in history. A heavy metal band named Method Of Destruction wrote a song about Mr. Chapin's incident called, Ode To Harry. It is a really funny song. Hey, I am writing an article about this song and found your site. I just want to say I really appreciate your gesture here. It's a sad story. It's also possible Gene pulled a heroic act at the end by turning the truck over and avoiding smashing into the filling station or any more people. Either way, really neat to see these personal accounts on here. I've always been curious about this song, but never researched it before moving from Florida to Pennsylvania, and ending up near Scranton. Recently I was listening to Greatest Stories, and the song came up again. So here I am, and I've enjoyed reading the comments, especially from those who presumably knew Gene and his family. First of all, anyone who would resent Harry Chapin for writing this song are way off base. Harry didn't have a mean bone in his body, and the song in all likelihood was written deliberately fictitiously so as not to impugn Mr. Kelly's memory. As someone else has said, it's a song. Written from a recollection of someone as a second-hand account. Gene's name isn't in the lyrics, and there is no blame implied. Scranton should indeed erect a plaque near the site, like the one in Winslow, AZ. The town has become well-known because of the song, and it would be a fitting monument to a man that I have found to be a well-known husband, father and member of the community. God bless Gene's family and his memory. And thank you, Harry Chapin, for your song, which has brought his memory to life. Chapin's song was never released as a single, and was only on one studio album and two live albums (one posthumously), though it was often performed at his concerts. As such, there's no way to estimate the proceeds the song may have earned. Therefore I think it's unlikely that Chapin would have pledged such proceeds in one direction or another. Chapin's song was never released as a single, and was only on one studio album and two live albums (one posthumously), though it was frequently performed at his concerts. So there's no way to determine what proceeds would have been derived from the song. Therefore, I think it's unlikely that Chapin would have pledged the proceeds from the song in one direction or another.